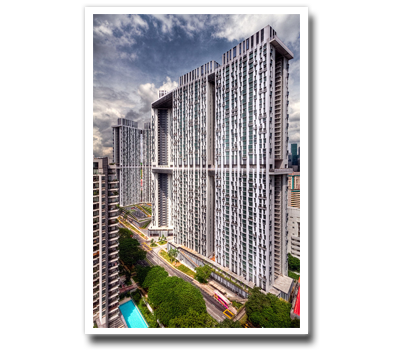 The Pinnacle @ Duxton is an award-winning 50-storey residential development in Singapore's city center, next to the business district built with great effort towards the sustainable quality of life and sense of place. The project features the world's two longest sky gardens of 500 metres (1,600 ft) each, on both the 26th and 50th floors. All seven connected towers are collectively the world's tallest public residential buildings. Unique amongst Housing and Development Board (HDB) projects, it is the design winner of a worldwide competition which attracted more than 200 entries. Residences are designated as special types, S1 and S2, having altogether 35 different unit variations – with dissimilar combinations of features such as extended bays, balconies, bay windows and planter areas. The Pinnacle @ Duxton has enlivening spaces and creates a quality experience for the users. The Pinnacle @ Duxton, as it curves across its site, takes the concept of “streets in the sky” to a new level, providing integrated public outdoor green spaces with its two linear sky parks providing a fascinating experience in high density living and how we can make best use of our limited land resources. All the more impressive is that The Pinnacle @ Duxton was able to accomplish such a high level of execution and the inclusion of so much public space within the constraints of a public housing project. Very rarely do you see such success in making a public housing project a clear architectural statement. 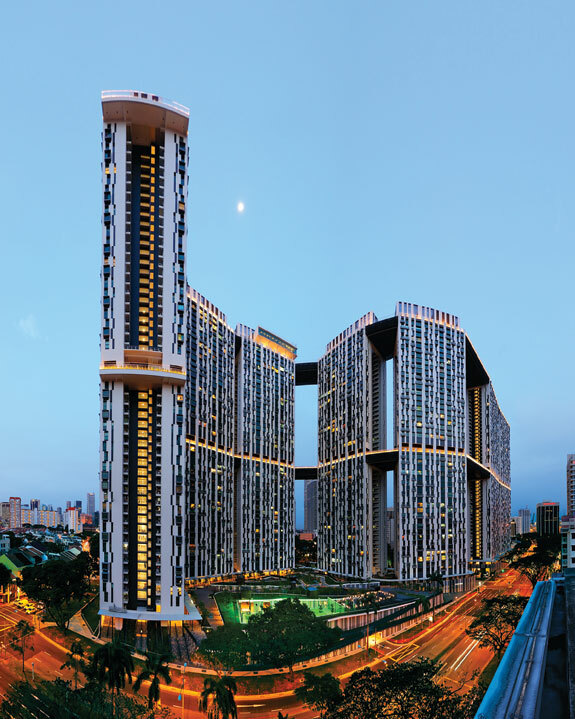 The Pinnacle @ Duxton was conferred the 2010 Best Tall Building (Asia and Australasia) award by the Council on Tall Buildings and Urban Habitat, as well as the 2011 Urban Land Institute's Global Awards for Excellence. The Pinnacle @ Duxton has been featured in numerous local and foreign documentaries, including Discovery Channel's "How we invented the World: Skyscrapers"
The Pinnacle @ Duxton defines super-density housing with 1,848 apartment units built on a plot of only 2.5 hectares (6 acres)—only slightly larger than two football fields. Public housing as an architectural typology is inherently complex. It marries housing—the most private of programs—with public space. The public housing project addresses pragmatic, financial, social and even political issues. Add to that an irregular west facing site in the heart of Singapore’s congested central business district, trees to be conserved and required connections to the neighboring park and community center, and the brief is incredibly complex. Within the development, residents enjoy the convenience of shops, a food court, an education center, a childcare center, and two community centers. Beyond the development, residents are served by two train stations which link them to the island-wide mass rapid transit system and bus stops at the development’s doorstep. 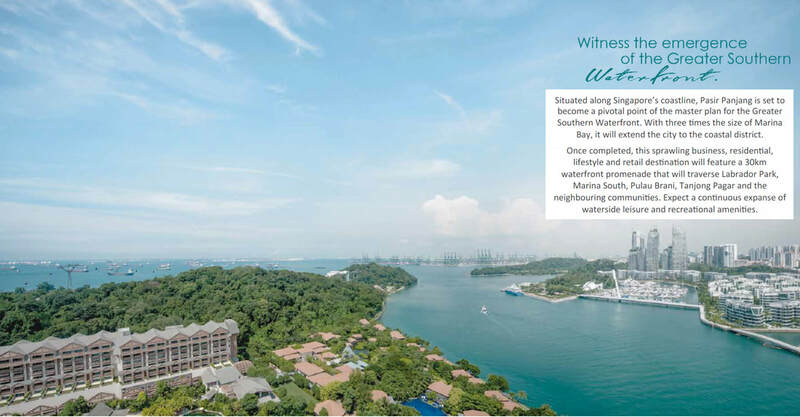 Exploiting the inherent sustainability of the high-density, high-rise housing model, The Pinnacle @ Duxton creates a walkable and diverse community, and provides a connected, convenient and compact model of sustainable urbanism. 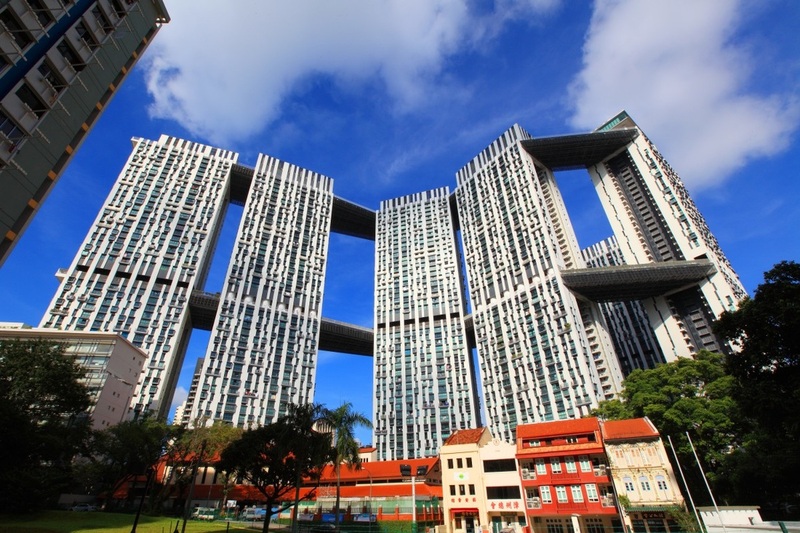 Besides being the exclusive and rare new HDB BTO in the heart of Tanjong Pagar Central Business District, The Pinnacle @ Duxton is also an iconic public housing project in the resale market, here are five other interesting facts about this architectural landmark. Located at Duxton Plain, The Pinnacle @ Duxton is built on a 2.5ha site where the first two blocks of public housing in Tanjong Pagar - among the oldest public housing estates in Singapore - originally stood. The housing project's story began in 2001, when the Urban Redevelopment Authority organised an International Architectural Design Competition to find a design worthy of being erected on the site. The winner, local firm ARC Studio Architecture + Urbanism emerged the winner, worked with RSP Architects Planners and Engineers to produce it. 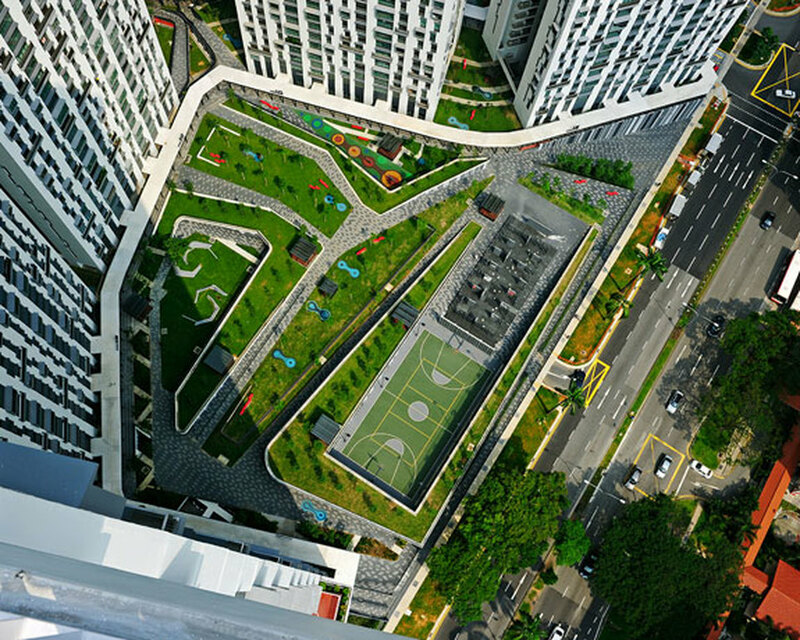 The Pinnacle @ Duxton is the first 50-storey public housing project in Singapore, and also the first one in the world to have two sky bridges linking the seven towers that it comprises of. Its design was considered groundbreaking in the field of public housing. The Pinnacle @ Duxton is the recipient of several design awards. In 2010, this project won the prestigious Best Tall Building Asia & Australasia award from the Council on Tall Buildings and Urban Habitat, a US-based international authority on tall buildings and urban design. The Pinnacle @ Duxton also won the prestigious President's Design Award Singapore in 2014. Spanning 500m each, the sky gardens are located at the 26th and 50th floor of the building respectively, offering panoramic views of the cityscape. The one on the 26th floor is exclusive to residents, but the 50th floor Sky Bridge is accessible to the public on most days from 9am to 10pm for a small fee of $5 (free for residents of Pinnacle @ Duxton with magnetic access cards). A cool feature of The Pinnacle @ Duxton's flats is that the walls within it are made of lightweight concrete. This allows residents to easily remove and reconfigure them according to space or aesthetic needs. Continuous Sky Gardens on the 26th and 50th floors weave through the seven tower blocks, forming a simple yet powerful sculptural skyline that creates a strong identity for the project. Twelve Sky Gardens are conceptualized as displaced landscapes like a Sky Gym, Hillock, Crater, Meadows, Lounge, and Beach. They function as an extension of the living environment for residents, forming almost 1 hectare (2.5 acres) of new land. Designed with children playgrounds, an outdoor fitness gym for the elderly, landscape furniture resembling beach deck chairs and outdoor sofa sets; they provide diverse, creative and unusual spaces for community interaction. They also function as areas of refuge in case of emergencies and allow the sustainable sharing of mechanical services, reducing seven sets to just three. The seamless connection created by the linked sky bridges allow for the entire development to be enjoyed by all residents. The environmental deck forms a green lung for the city. Landscape elements comprising pavilion, benches, and exercise nodes are plug-ins to this extended park network and function as location markers as well as vibrant community nodes. the pinnacle @ duxton by a resident real estate professional?